WASHINGTON (AP) — North Carolina’s Thom Tillis on Monday became the second Senate Republican to promise a vote to block President Donald Trump’s declaration of an emergency at the Mexican border. He revealed his view a day before the Democratic-run House was set to vote to annul Trump’s emergency declaration, which he made Feb. 15. The declaration would give Trump access to billions of dollars beyond the nearly $1.4 billion that Congress approved to build segments of barriers along the boundary with Mexico. While Republicans control the Senate 53-47, it seems likely there would be enough GOP defectors for the measure to win initial approval there. The bill would need a simple majority to pass, and four Republican defectors joining all Democrats and their two independent allies would suffice. Trump has promised a veto and it seems all but certain that Congress won’t be able to muster the two-thirds majorities required to override a veto. Even so, the votes are posing tricky decisions for GOP lawmakers from swing states, where Republican voters are divided between Trump loyalists and those with more moderate views. The only other Senate Republican to clearly declare a vote to block the emergency is Susan Collins of Maine — who, like Tillis, faces a potentially competitive re-election next year. Sen. Lisa Murkowski, R-Alaska, who doesn’t face the voters until 2022, has said she is likely to oppose Trump’s emergency declaration. In an opinion column posted late Monday by The Washington Post, Tillis wrote that while he agrees with Trump that there is a crisis at the border, he has “grave concerns when our institution looks the other way at the expense of weakening Congress’s power” over spending, which is granted by the Constitution. 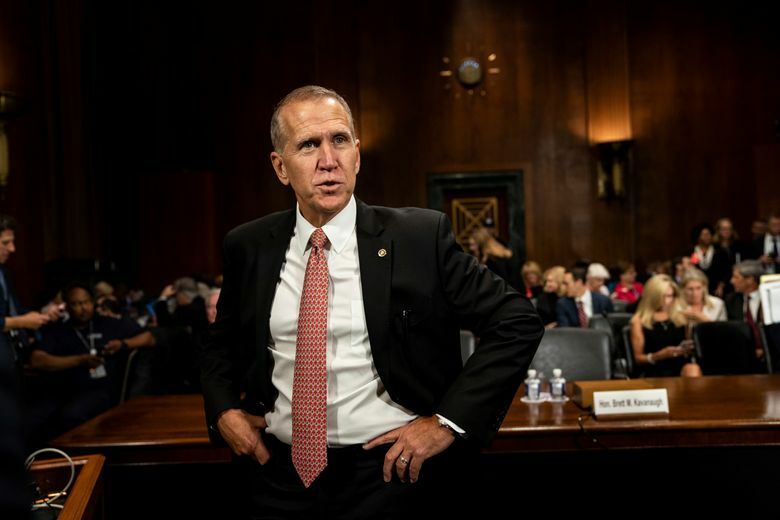 Tillis noted that Republicans complained when former President Barack Obama used executive powers to protect some immigrants in the U.S. illegally. “There is no intellectual honesty in now turning around and arguing that there’s an imaginary asterisk attached to executive overreach — that it’s acceptable for my party but not thy party,” he wrote. He said that as a conservative, “I cannot endorse a precedent that I know future left-wing presidents will exploit to advance radical policies that will erode economic and individual freedoms,” such as restrictions on polluters, banks and guns. Vice President Mike Pence was expected to attend Tuesday’s weekly lunch of Senate Republican senators in hopes of persuading them to vote to support the emergency declaration. House Minority Leader Kevin McCarthy, R-Calif., said enough Republicans would support Trump’s emergency that the House won’t be able to muster the two-thirds majority required to override a veto. It would take 55 of the 197 House Republicans to join all Democrats and reach the 290 votes needed to override what would be Trump’s first veto. “There’s an emergency along the border,” McCarthy said in a brief interview, describing the argument GOP leaders are using to tamp down Republican opposition. Democrats and some Republicans have argued there is no border emergency and say Trump declared it simply to get around Congress. By law, the Senate is supposed to vote on the measure within 18 days of receiving it from the House. But Congress has not challenged a president’s emergency declaration before and it is unclear if Senate Majority Leader Mitch McConnell, R-Ky., will attempt procedural moves aimed at thwarting Democrats. Asked in a brief interview what he would do, McConnell said, “We’ll see what comes over” from the House. McConnell originally opposed having Trump declare an emergency, but said he would support it after Trump said he would sign the legislation this month that ended the record 35-day federal shutdown. Sen. John Cornyn, R-Texas, a close adviser of McConnell, said in a brief interview that the Senate would vote on the emergency declaration sometime in the next three weeks.